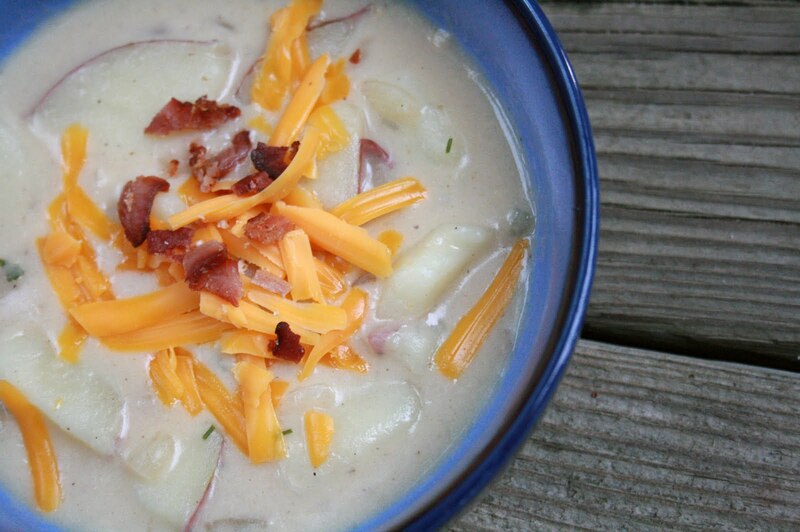 If you are looking for a potato soup recipe, look no more (and even if you aren't, you've got to try this soup. It's that good!). This soup is out.of.this.world. After having it at a friend's house for dinner, it has become part of the monthly rotation on our menu. It's a perfect comfort food, and I am excited to make it more now that fall is approaching. I think the secret is using fresh rosemary. I'm sure dried will do, but adding the fresh sprig gives it an extra kick. In a large saucepan, boil potato chunks until tender, about 15-20 minutes. Meanwhile, in a large saucepan, cook bacon until crisp. Drain, reserving 2 tablespoons drippings. Chop bacon into pieces and set aside. Saute onion and garlic in the drippings until tender. Stir in flour, salt, basil and pepper; mix well. Gradually add broth and water, stirring constantly- this process takes several minutes. Bring to boil gradually; - if you rush it, the consistency of the soup will be grainy and blah. Softly boil and stir for 2 minutes. Add sprig of rosemary. Add potatoes, milk, sour cream and hot pepper sauce; heat through but do not boil. Remove rosemary to serve. Garnish with bacon, cheese, chives and parsley. I never stop and tell you how much I love your recipe selection ! I actually tried this soup and we loved it ! I now plan to try your apple fritter bread, can't wait !! Yumm! I love potato soup. TFS!